* The application size is now under 10MB so it can be downloaded over the 3G network. * In listening to the players we have toned down the bright green color of the text on the selected books. So you think working in a library is easy? Let’s put your Dewey decimal skills to the test. Letter Matrix, a USA Network Games exclusive, is a challenging game that appeals to the consummate wordsmith, as well as the novice speller. It is a word game of tempo, starting slow and becoming faster as it tests a player’s ability to balance wit, strategy and composure, while creating words. 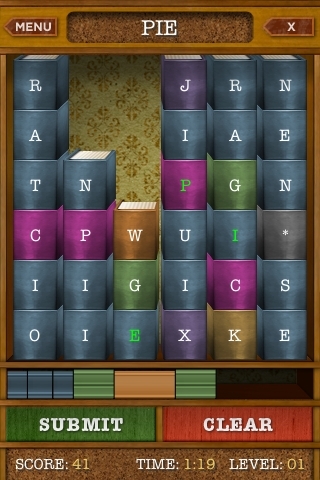 As books fall, choose letters from any position in the stack to form words. If you let all of the books stack up to the top of the game play area, the game is over. 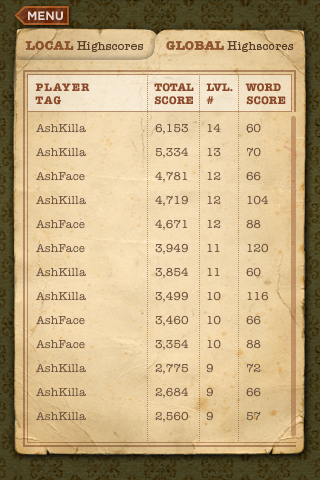 While trying for the large word scores yields more points and bragging rights, it also increases pressure and creates a scenario where one wrong move could cost you the game. As the game progresses through its 20 possible levels, balancing strategy and composure is critical – even the seasoned word game veteran will have to fight to stay alive. 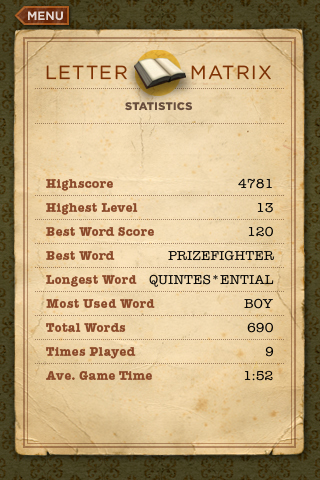 Pay attention to letter values and word length bonuses to really maximize your score. * Multiple touch methods to clear, submit and alter words. 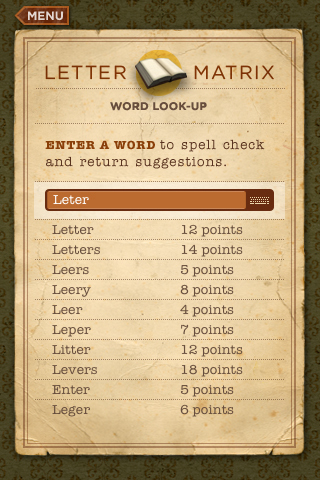 * Word Look-Up: spell check, return suggestions and get point values. * High Scores: local & global high score lists to track your standing. Developed by GlowPlay, a division of Glow Interactive (www.glowplay.us), the game boasts clean, crisp graphics and smooth game play. Aged paper and wooden bookshelves provide an authentic old library feel. The soundtrack plays along at a very calm and refreshing rhythm, but as the game changes pace the tempo increases, adding feelings of challenging pressure. Enjoy.